Walnut Oil Gel is a thixotropic painting medium made with walnut oil and pyrogenic silica. Walnut Oil Gel is a clear pale amber gel that adds transparency and thixotropic body to oil, resin-oil or alkyd paint. 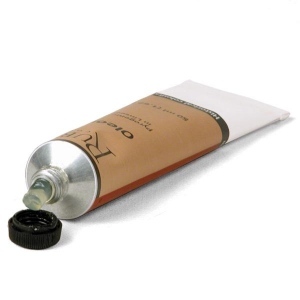 Add directly to your paint to give it transparency without thinning its consistency. Add pigments or extenders to thicken it for creating impasto effects that do not sink in. 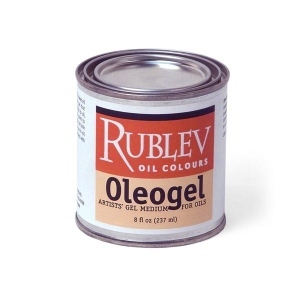 Walnut Oil Gel does not contain driers or solvents, so it is safe to use in oil painting without worry of cracking. When mixed with oil colors, Walnut Oil Gel will increase the drying time. Walnut Oil Gel in the center, Lead White on the left and a mixture of Walnut Oil Gel and Lead White on the right. Lead White is stiff, plastic and short, but when mixed with Walnut Oil Gel the mixture is semi-transparent, soft, yet sculptural. Rublev Colours French Raw Sienna at left and a mixture of Walnut Oil Gel and Raw Sienna on the right. Below each is a brush out of the above examples. Rublev Colours French Raw Sienna is long, yet holds strokes well. When Walnut Oil Gel is added to Raw Sienna it increases transparency without causing the flow out and leveling of brushstrokes. To make your own paint with Walnut Oil Gel, add directly to pigment powder until a stiff paste is obtained (almost the consistency of putty). Grind the paste with a muller on a flat surface before storing in collapsible tube. Some of its thixotropic property will be temporarily lost when grinding Walnut Oil Gel with a muller, but should be restored when allowed to stand.